So my inaugural post was signed off saying I would post daily… I don’t even really want to look at how long that was ago, but I know it’s been too long. Let me explain. Ben the horse came in a few weeks before Christmas a little bit slow and miserable. It was dark and cold, so I didn’t really think much of it and popped him in his stable hoping that dinner may cheer him up. As I was drying off his legs, I realised that he had hurt himself. His front leg was up like a balloon and he really didn’t want me touching it. I cleaned it up and saw that he had sliced his foot just below the fetlock. But it didn’t look too bad, so I popped some purple spray on it, gave him a painkiller and left him to sleep. The next morning, in the light, I had another look and realised it had gone much deeper than I had thought and it had swelled more overnight. So a quick call to the vet and she was there an hour later. I thought it was probably infected as it had been pretty muddy and guessed he would need antibiotics and box rest. Poor thing. But it was worse than I thought. The vet couldn’t see past the swelling, but the location of the cut was dangerously close to the tendon sheath and her words were that ‘if he has missed the tendon, he is one of the luckiest horses I know.’ She told me that we needed to wait until the next day when hopefully the swelling would have gone down to see if we could see any tendon damage. Meantime, he had a huge shot of antibiotics, a tetanus injection and shot of something else. If he had gone through the tendon, he would need surgery. Being 23 and having had a very difficult recovery from surgery six years ago, I wouldn’t put him through that again. So followed a very worrying and upsetting 24 hours. 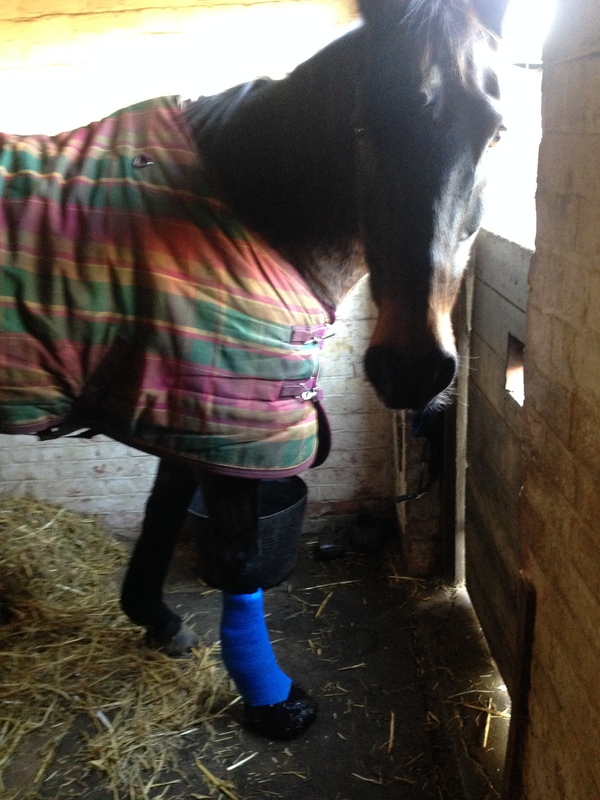 But in true Ben style (he’s something of a war horse), he pulled through and when the bandage came off the following day, it had gone down and there was no sign on tendon damage. But then that evening, I arrived at the yard to find that he had barely eaten a thing and was really not himself. He kept standing at the back of his stable, not responding to anything much at all. I went back two hours later to check him and still he had eaten nothing. Panicked text to the vet. She told me to keep checking him every few hours, as she was worried about colic. At the 6am visit (yes, we went at midnight, and 2am and there was very little change) he had suddenly picked up again and eaten all his feed, had a kip and was whinnying at me again. Turns out the antibiotics had hit him like a freight train, poor old chap. but once he had finished the course, he quickly got back to himself. 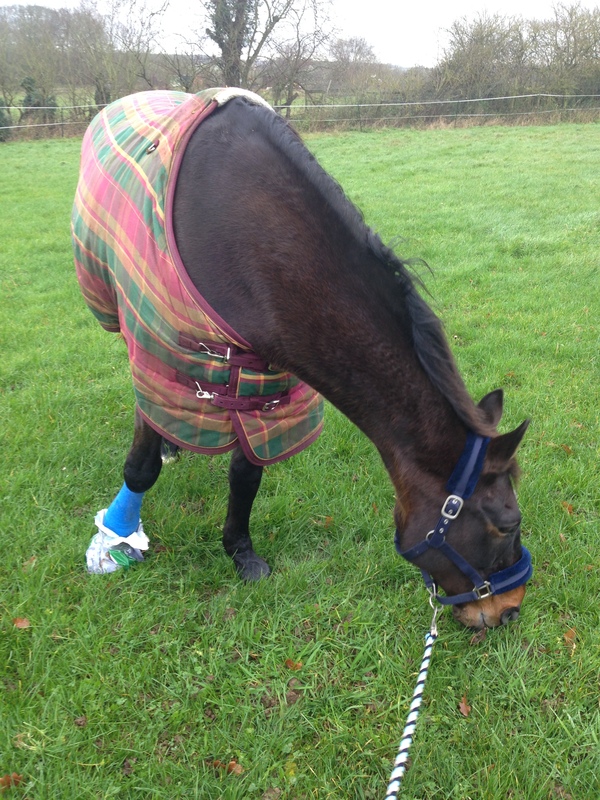 He’s now out in the sick paddock each morning, after lots of hand grazing, the bandage is off and the cut is healing nicely, so fingers crossed, we’ve (literally) dodged the bullet and pulled through again. Such a worry these horses! !